Having a beautiful garden patio is always a good idea both practically, because you will have a place to rest and relax in natural surroundings, and get yourself away from everyday worries and household chores, and aesthetically because it looks nice. But maintaining that aesthetic quality of the patio is an entirely different deal. Outdoor furniture is very comfortable and pleasing, but it also needs attention as it is exposed to the weather conditions on a daily basis and continually needs your attention. Always have a cover when it rains, and always be prepared to clean them when needed. Cleaning outdoor furniture is in most cases, pretty much the same as house cleaning. All you need to do is focus your attention on the noticeable dirt and stains, and make it your job to remove them as swiftly and efficiently as possible. Of course, there is a huge variety of outdoor furniture, so not all cleaning methods apply to every single type, but all the basics of cleaning are the same, after all. All you need is a cleaning product and a microfiber cloth, and this basically covers all the tools you will need. The microfiber cloth is a much better choice than paper towels since its fibers can reach difficult places and easily clean up stubborn stains. And it is also reusable, which means that you will not have to worry about throwing away paper towels or looking for special recycle bins to throw your used towels in – you can be green without making an effort! The cleaning product you should use should be in accordance to the material of the outdoor furniture. Read the labels and take your pick accordingly. You might also want to invest in getting a green cleaning product – it is a bit more expensive, but you will use less chemically-filled substances on your furniture and will not have to worry about relaxing on top of different toxins. You can start with upholstery cleaning, getting all the important parts of the furniture first, and then focusing on polishing the rest of it and removing all the stains and stubborn spots. Of course, you may need to remove the twigs and branches and leaves first, depending on the weather conditions, how strong the wind was, and how much waste it blew your way. This is something you will never get rid of, so use covers perpetually so that you can at least skip this step. 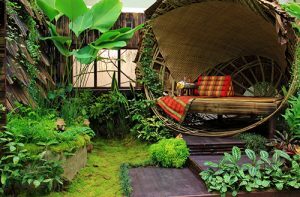 Covering the outdoor furniture is especially important if you have bamboo furniture, since the rain will soften it up as bamboo is basically hard grass, and any use before it dries up will make it bend and it will eventually become warped and uncomfortable at the very least. Do your research on the different specific types of furniture material and clean it accordingly. Alternatively, you can always hire a cleaning company to do it for you, though wiping a few chairs and a table should not be a major problem for anyone. Keep your outdoor furniture clean and cleared up and you will have the best place to rest in. All it takes from your part is some attention and maintenance.